Hardware such as Fitbit and the Apple Watch can be powerful motivators to stay healthy, but how can consumers know how much information their apps are collecting about them and how it is used? When the General Data Protection Regulation comes into effect on 25 May 2018 the context in which businesses and their customers collect, share and use data will change forever. GDPR will allow for a rebalance in terms of the relationship between data seekers (businesses for example) and individuals. Finally, individuals – customers – will have more say over how their personal information is captured and processed. Companies will have to ensure the data they hold is valid, confidential and fit for purpose. Under GDPR notions of privacy, consent, transparency and accuracy become paramount. And while these new regulations will enforce businesses to reset how they operate, it’s clear that this redistribution of power will enable them to innovate and allow for new equitable and sustainable opportunities. This premise lies at the heart of MetaMe, a personal data wallet and marketplace led by London-based entrepreneur, acclaimed digital innovator and author Dele Atanda, who advocates the use of ‘Clean Data’. The Clean Data economy is underpinned by privacy, individual ownership and mutual benefit for individuals and businesses from the use of personal data in contrast to the nefarious tracking and exploitative data acquisition practices of the surveillance led ‘Dirty Data’ economy. In the Clean Data economy businesses pay individuals for their data creating a more fair and equitable relationship between both. Clean Data is made tangible by MetaPods (mPods), which are crypto information objects that use artificial intelligence (AI) to enable granular, precise and minimum units of data to be isolated and encrypted based on an intention – buying or selling health insurance for example. mPods are shared and traded privately and contextually in exchange for Krypto Koins, MetaMe’s currency. “To give an example of how mPods can revolutionise the digital sphere, let’s use the burgeoning wellness industry as a demonstration. “mPods are effectively like digital cards – they serve information. Each card has a colour code and a score. The colour code – or RAG status – relates to how identifiable the information stored on each card is. So a green card shows that no information on that card can be used to identify the individual. An amber card means some information could be identifiable. A red card indicates that some or all of the information is confidential. “The score signifies how sensitive the information is. 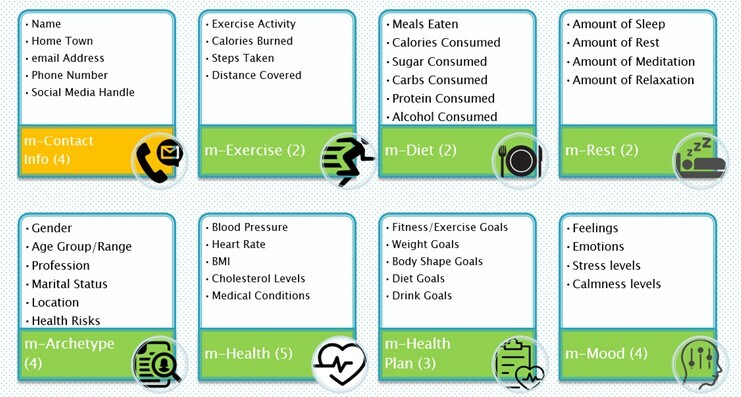 So the m-Exercise card has a score of two out of ten because it contains no sensitive material – this information (exercise activity, steps taken etc) is similar to data captured by any standard activity tracking device such as a Fitbit. The card is green because it contains no identifiable information. “MetaMe’s system makes it easy for people to understand how sensitive their information is and therefore how careful they need to be with it. Moreover, the more sensitive the information the more value it has to companies operating within the wellness sphere and thus the more people can expect to be paid for sharing this information with brands in our marketplace. “As a non-identifiable and low sensitivity card, the m-Exercise pod could also be shared with a personal trainer. The trainer could check how well an individual was maintaining a fitness programme. If required, the trainer can provide remote coaching, intervention, support or motivation according to an individual’s performance. “At all points, the value of an mPod is couched in a contextual manner. Sharing health or exercise information with an insurer will therefore command more value when looking for life insurance. This is key. The value of an mPod is based upon identifiability, sensitivity and context. The value of an mPod fluctuates depending on who’s enquiring for its information. “If you want to maintain a healthy lifestyle for example you could share the m-Diet, m-Exercise and m-Health Plan cards with companies you know will provide you with healthy products. These companies will pay you for this information to better understand you as a customer and better tailor their products and services to your needs. By selling these mPods to relevant companies you can receive tailored offers in a seamless and transparent manner. You only need share the minimum amount of information required to achieve your goal – in this case earning money and getting healthy products and services tailored to you. “You can take this further and use these mPods to receive concierge services from your personal trainer, nutritionist and the marketplace based on your wellness behaviour and data. The choice is always in your hands. You choose how much – or how little – information you s hare and you will only receive information or offers that are relevant to your requirements. “Only companies that meet ethical and responsible data usage criteria that agree to abide by the rules of MetaMe’s marketplace will be able to access your mPods. You won’t even have to manage mPods on an individual basis. You can put rules around your data and only companies that meet your criteria will be allowed to access your mPods. You can do this holistically or individually by mPod. “With MetaMe you retain complete sovereignty of your information. You’re just allowing third parties to access your data as and when the need requires based on rules that benefit you and brands you like and trust. Your information is no longer scattered across the web, it’s in your personal data store under your control. “And while this might seem like a giant leap into the dark, it isn’t really. In the digital era we are used to sharing things on social media and getting recommendations based upon previous purchases. This is no different. That photo you shared on Facebook is a piece of information. The like you received on Twitter for your latest playlist is of value. Recommendations can only be served because of data companies hold about you. “The key objective of mPods and MetaMe, the app used to make them, is to create a framework whereby people can be paid and fairly rewarded for sharing this data safely without having to think about it. The culture of sharing information and receiving recommendations is well established and the ecosystem is in place. It is just that the value exchange is out of balance. It’s not a huge cultural shift or massive behaviour change for people to be rewarded for the sharing they already do regularly. We’re simply applying behavioural patterns already embraced in a slightly different and more personally beneficial manner. “The big social media companies are making billions of dollars on the back of people sharing information. What MetaMe aims to achieve is the same, but making that exchange, that transaction more equitable. Dele Atanda continues, “MetaMe’s primary commercial model is to enable people and businesses to share information with each other in a mutually beneficial manner, creating a virtual circle that encourages both sides to share more with each other. “Not only does this eliminate waste by ensuring that businesses are ultimately matched with people who value their services and people are able to find products and services they require or desire, but more importantly it lays a foundation for the fair and ethical use of data and artificial intelligence to benefit people, companies and society as a whole.